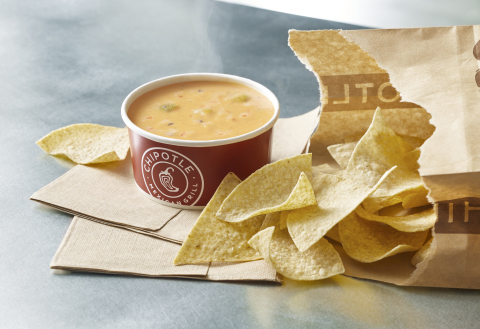 Earlier this summer Chipotle started testing a queso dip at some of its stores. Now, the burrito chain is ready to roll out the spicy, cheesy, side to the whole country. Starting next Tuesday, September 12th, queso will at all Chipotle locations nationwide. Unlike some versions of the dish that are served with tortillas, Chipotle’s version is a spicy cheese sauce meant to be used as a dip for chips or added to a burrito. The nationwide version of the dip is slightly different than what the chain has served at its test locations but, as with everything else at the restaurant, it is made with no artificial flavor, colors, preservatives or industrial additives. “Additives make typical queso very consistent and predictable,” Chipotle CEO Steve Ells said in a statement “Our queso may vary slightly depending on the characteristics of the aged cheddar cheese used in each batch.” You can read more about how the company developed its queso recipe from when the dip first made its way into Chipotle’s test kitchen. Pricing will vary from city to city, but on average adding queso to your burrito or other entree will set you back $1.25, while a large side of the dip will cost around $5.25.